Our vision is to celebrate each other's music, never to compete. 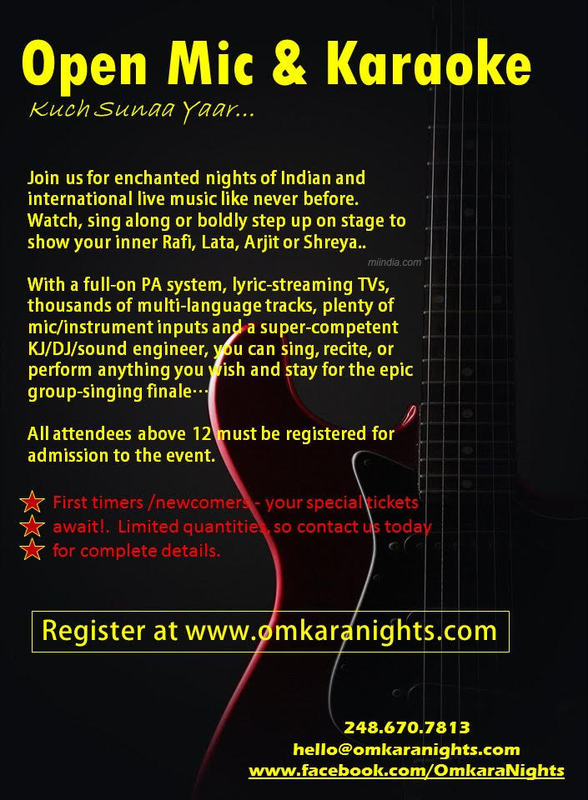 Join us for enchanted nights of Indian and international live music like never before. Come to just watch, hum along or boldly step up on stage to show your inner Shreya, SPB, Rafi or ARR. Geet, ghazal, regional....it's by SENSATIONAL YOU! New: Complimentary pizza and refreshments and a very friendly register-now-pay-at-the-door process. FIRST-TIMERS - your special discounted tickets await! Limited quantities and dates and there's no time to waste! Register and check out videos & testimonials at www.omkaranights.com.